The Coyote Oak Journal - What Made This Track? The most common tracks I see on trail runs are the footfalls of people, dogs, and coyotes. But anything that moves, or is propelled across the ground can make a track. If you look closely, interspersed between the myriad of hiking boots, running shoes and fat tires are some unique and interesting tracks. Some less common tracks are fairly easy to identify. For example, this sinuous track in sandy soil was clearly made by a snake. But others, especially when first seen, can be quite bewildering. Even when the basic identity of a track is known, there are other questions that can be asked. 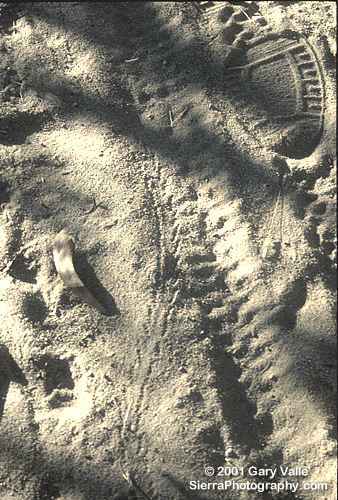 In the case of this snake track, two questions come to mind. What kind of snake made the track? What direction was the snake traveling? The most common snakes seen in the area are rattlesnakes. 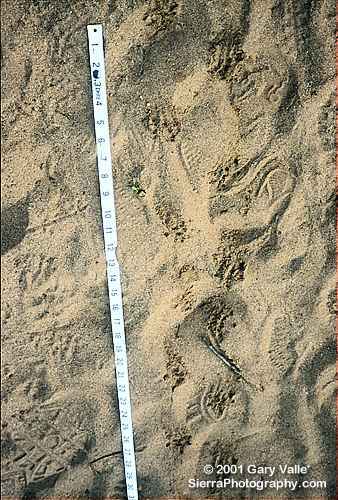 A mature rattlesnake moving slowly in sandy soil makes a fairly distinctive "squeezed out of tube" track suggestive of a heavy-bodied snake. Another snake seen on this trail is the Striped Racer. Racers are fast, narrow-bodied snakes with a more direct, streamlined track than a rattlesnake. A young rattlesnake was found further down the road, and my guess is that this track was also made by a young rattler. 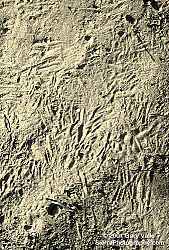 What animal made these numerous scratch marks? You may have seen dogs wipe or scratch their feet after relieving themselves, but these fastidious scratch marks are reminiscent of a feline's "cat box" behavior. 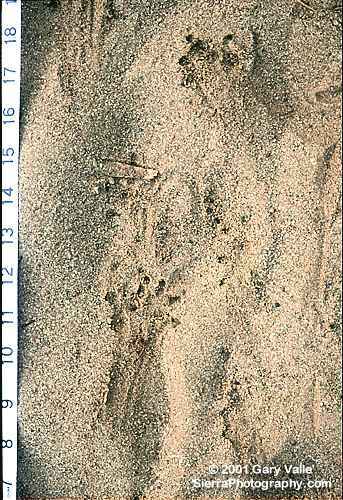 Len McDougall, in The Complete Tracker, comments that "Unlike those of a cougar, which most often scratches from the direction it departed, bobcat claw marks tend to be from all directions..."
In this close-up of the claw mark in the foreground it appears the forefoot was expanded in typical feline fashion as the cat dug in its claws. If it was a bobcat, it was a fairly large one, with a forefoot width of perhaps 2.5-3.0 inches. 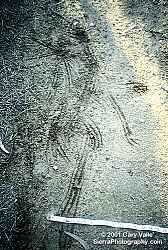 In April of 2000, while running in the Simi Hills, northwest of Los Angeles, I came across this very strange track. 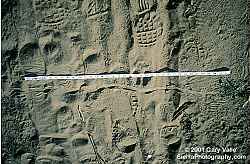 In the following days there was an explosion of these tracks over a dispersed area of perhaps four square miles. Leafing through my references, the first hint was gained from Field Guide to Animal Tracks. 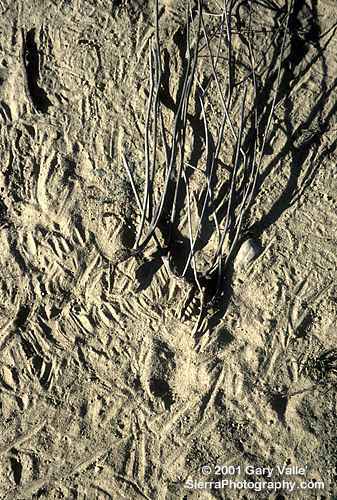 Further investigation suggested the tracks were probably made by a Western Spadefoot Toad (Spea hammondii) whose preferred habitat is grassland, scrub and chaparral. 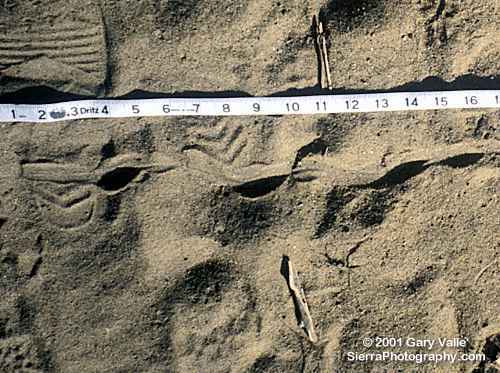 The drag marks are typical of tracks in soft sand and point toward the direction of travel. 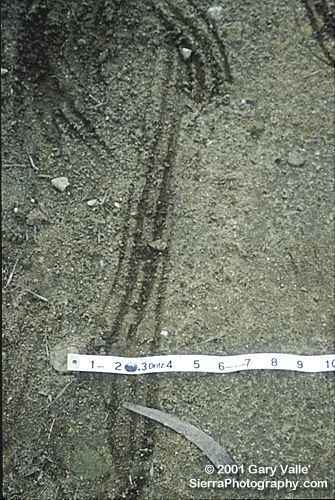 This Spring (2001) there were very few of these tracks, so it seems that environmental conditions results in varying populations from year to year. Some tracks are just plain bizarre... These were scattered across a sandy fire road. Reminiscent of the overlapping tracks of a covey of quail, the incongruous tracks suggested a pattern, but I couldn't quite put my finger on the type of pattern. After my experience with the toad tracks almost anything seemed plausible. Searching the area the culprit (an uprooted Mustard) was found just a few feet away. Reading tracks reminds me that something cannot exist without affecting its surroundings. The effects may be so tenuous as to be nearly imperceptible, or so catastrophic as to be immeasurable, but interaction in some form is a prerequisite for being.